As the name indicates, Over Pressure Protectors save instruments from over pressure. 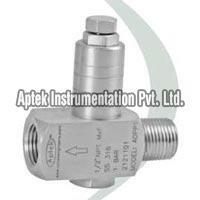 Over Pressure Protectors close at a set point, thereby protect the instruments from over load. We bring forth the finest range of Over Pressure Protectors for the clients spread across the world. We are a famous Over Pressure Protectors Manufacturer and Exporter, based in Naroda (Ahmedabad, India). 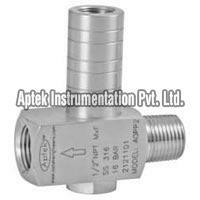 The company is a famous Over Pressure Protector (Model No : AOPP 1) Manufacturer and Exporter, based in Naroda (India). The Over Pressure Protector, offered by us, is highly demanded amidst the clients for its excellent quality and compact structure. The Over Pressure Protector is provided by us at the most competitive prices.